Denim is on trend yet again and it has even been on the runway for the Spring 2015 collections. Along with it's rise back in fashion is it's innovative appearance in beauty. Konad, the brand the brought us "stamping" nail art, is getting on with the denim trend by introducing to us their Classic Jeans Nail Collection. 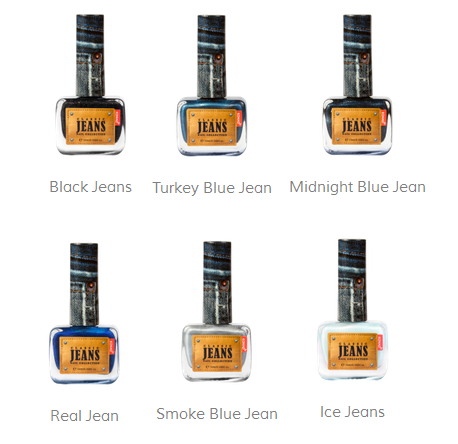 Konad's new product, the Classic Jeans Nail Collection comes in six shades: Black Jeans, Turkey Blue Jean, Midnight Blue Jean, Real Jean, Smoke Blue Jean and Ice Jeans. These nail polishes mimics the texture of jeans with great color impact. It claims to have smooth nail polish application and is long lasting. 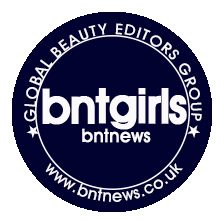 It also is free of toluene and other harmful components that are present in other nail lacquers. Toluene exposure leads to toluene toxicity and can either be from short term or long term exposure. This primarily targets the central nervous system. Thankfully most companies removed them from their ingredient list. You can be rest assured that Konad doesn't have any harmful components in their nail polishes. So here are the pretty nail lacquers from the Classic Jeans Collection. On the right is the Midnight Blue Jeans polish and on the left is the Smoke Jeans polish. I'm quite surprised that this is a textured lacquer since I didn't really notice it until it has completely dried. More sandy than denim but a very fine sand effect. I think you can't really get a fabric texture but it comes quite close. It takes 2-3 coats of polish for it to be completely opaque but it does apply quite evenly.The Midnight Blue Jeans has very fine blue and silver glitters in it, not really noticeable but it does give a denim effect. The Smoke Blue Jeans isn't really blue. It's more gray and reminiscent of stone or acid washed jeans. The wear of this polishes are impressive since they lasted a good 5 days before I saw wear and chipping on them. Mind you, there was no top coat involved so that, in my books, is a long lasting polish. I have previously reviewed Konad Stamping Nail Art Kit so check that out if you're interested to see more products from Konad!